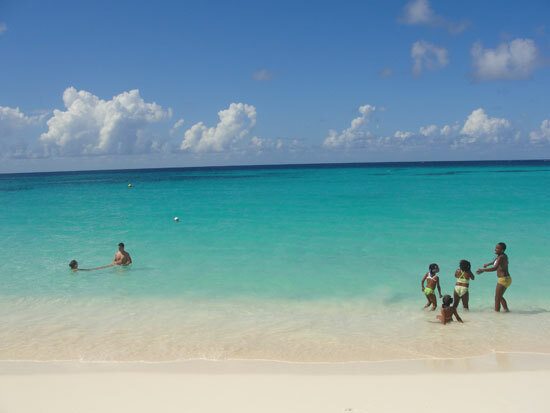 Anguilla beaches... Flawless Anguilla beaches... The first thing that made us fall in love with Anguilla, kept us coming back, and inspired this very website. 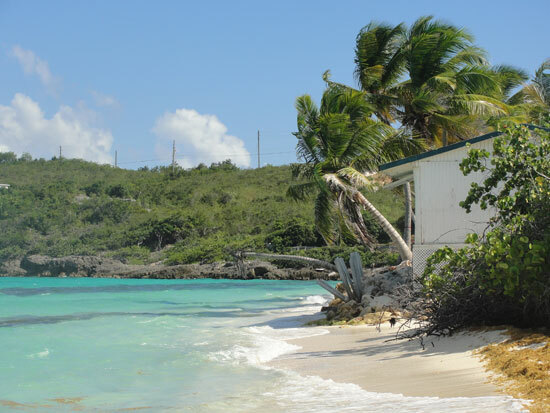 Since our first "Anguilla love," we have discovered even more to love about Anguilla. From the warm-natured and kind people, to the five-star dining, to the culture and heritage, Anguilla is about more than just beaches. But its beaches are impossible to beat! 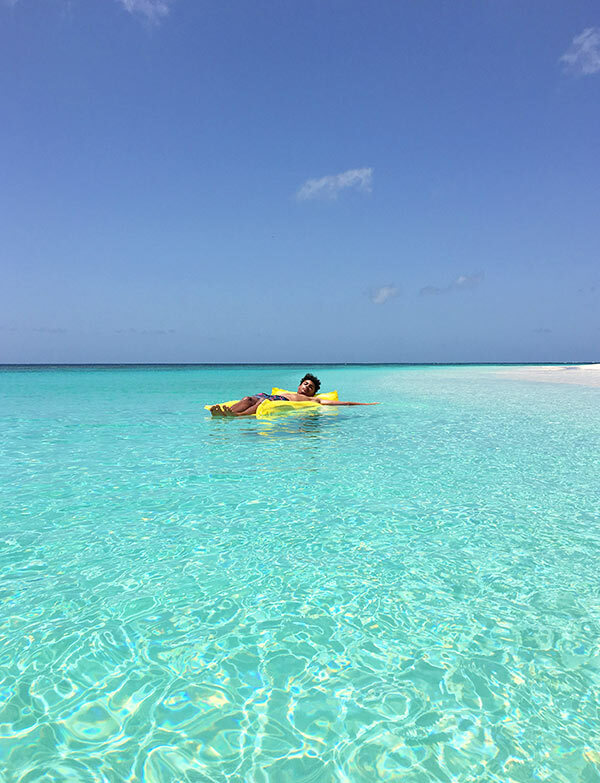 Here, Kristin Bourne takes us on a tour of some of her favorite Anguilla beaches. Stop #1? Anguilla's most famous beach, Shoal Bay Anguilla beach. 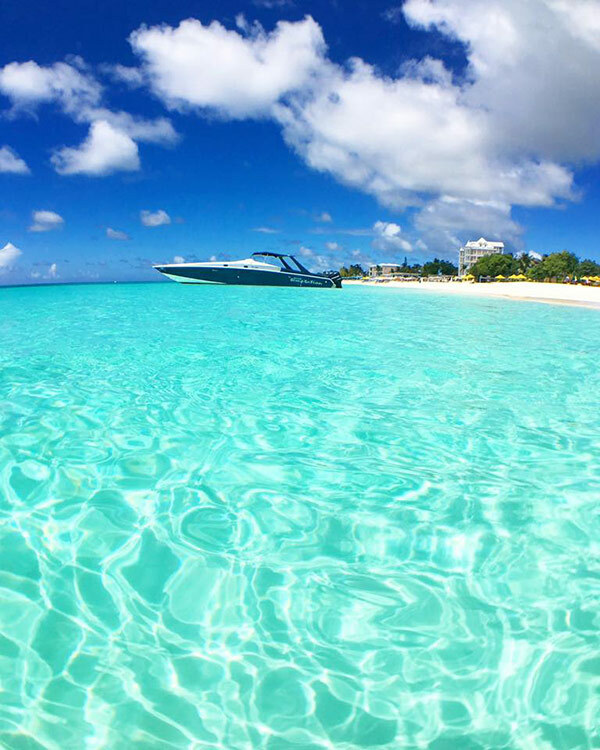 More is written about Shoal Bay than any other Anguilla beach. 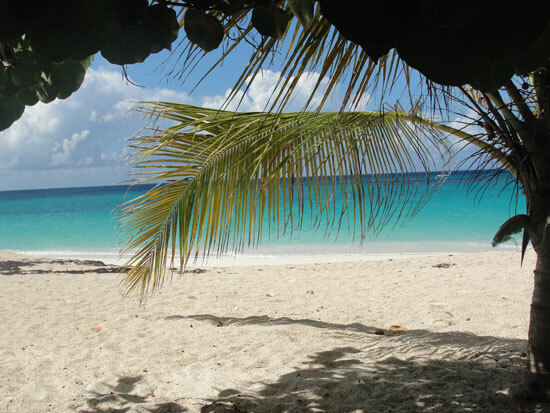 Consistently it ranks as one of the top beaches in not only the Caribbean, but the entire world. It's easy to see why! 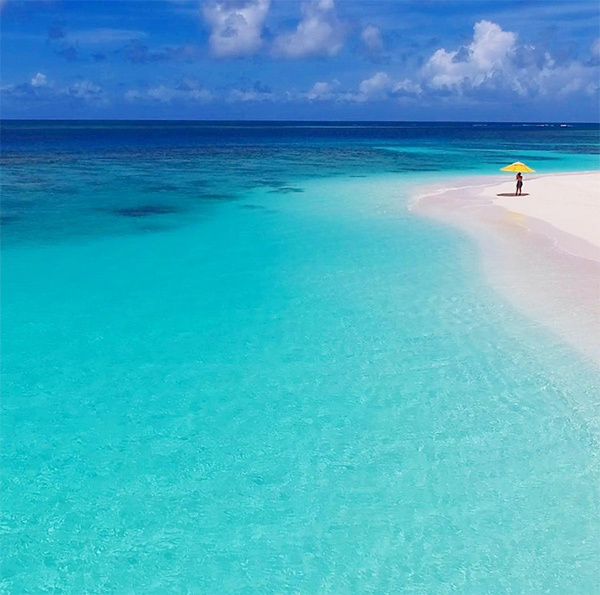 There is no other way to say it... Shoal Bay Anguilla beach is beautiful, with its pinkish-hued white sand and intense turquoise water. It is a two-mile sandy beach, and you can walk from one end to the other. 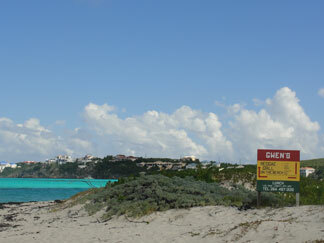 It is the "busiest" beach in Anguilla for tourists. 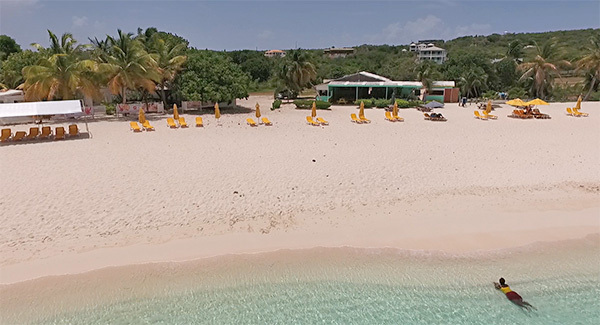 Mind you none of Anguilla's beaches could be considering "busy" or even crowded, unless we are talking about August Monday in Anguilla at Sandy Ground. 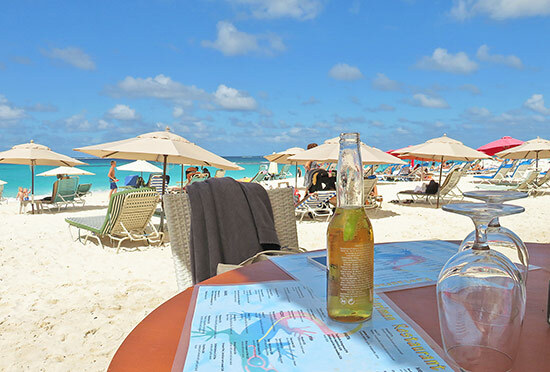 Restaurants, beach bars and hotels line Shoal Bay's shores. It is also the site of many peaceful water sports, including snorkeling, kayaking, diving, and distance swimming. You get the idea... Shoal Bay in itself is a destination. The beach is really divided into two parts: the lower half and the upper half. 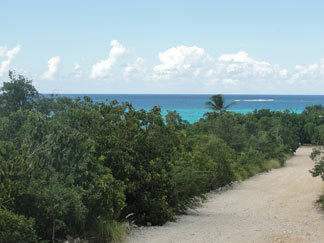 I started my trek by turning left off of the main road in to Shoal Bay. This road leads out to the road for Tropical Sunset Restaurant and Bar. I would call this the quieter end of Shoal Bay since Tropical Sunsets sits away from the cluster of restaurants and bars that form the "heart" of Shoal Bay. 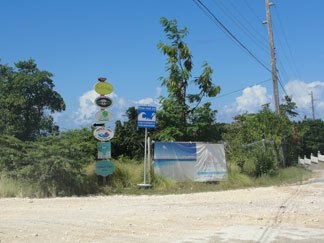 The "heart" of Shoal Bay is the area where many people park and enter the beach (between Madeariman and Uncle Ernie's). You reach it by remaining straight on the road to Shoal Bay instead of taking the left turn (on the dirt road) to Tropical Sunsets. Once on the dirt road, one fairly quick right at the Tropical Sunsets sign leads you down the little hill to Tropical Sunsets and the BEACH! You have arrived... Ahhh... Shoal Bay Anguilla beach! It never fails to take your breath away. That BLUE water, and so much of it! Who doesn't want to dive right in on a hot day? Destination: Perfect! Breath-taking Shoal Bay. Tropical Sunset makes for a very comfortable place for a Shoal Bay lunch. They also make the best pina colada I've ever had! It's not fancy but it is good. They make it from scratch and don't use a mix. Just the real stuff. Tropical Sunset is worth checking out if you want a quiet beach day. They offer umbrellas and chairs to use as well. If you are standing at Tropical Sunsets and facing the sea, farther to the west the beach is still wide and walk-able and is home to a few more businesses. 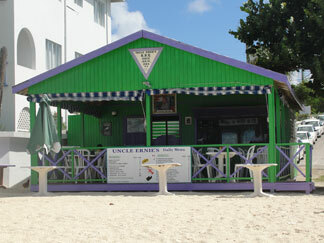 Gwen's famous Reggae Grill Previously on the other side of the beach, today, Gwen's has moved to the beach's west side. Still serving up the same mouthwatering BBQ lunches, and with that ever-warm and friendly vibe, you can read more on Gwen's Reggae Grill here. 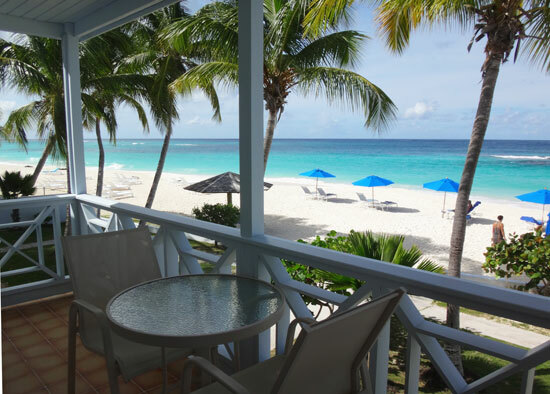 Further to the west from Gwen's is the largest hotel on Shoal Bay, Zemi Beach House. Back to Tropical Sunset, and to its right is everything else. I started walking toward everything else and noted the beach buildings along the way. Between Tropical Sunsets and the next establishment is just some seagrape trees and "bush". The next business is Mac and Hanks Restaurant and Bar. I haven't been here but it is a cute little place and seems to always have people at it. Just beyond Mac and Hanks you will find Madeariman Restaurant and Beach Bar. I have spent some time here recently and have been impressed and enjoyed myself. 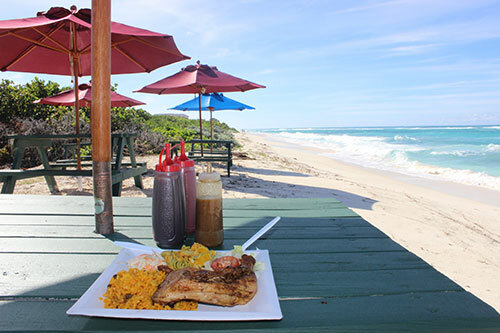 Beachy Blend of Sand, Surf, Shade, and Delicious Food at Madeariman! I could hear the music from Madeariman as I walked down the beach. I wanted to stop walking and go sit down and have lunch! Everything that I've tasted from there so far has been delicious! Immediately next to Madeariman is Uncle Ernie's BBQ. Uncle Ernie's offers your standard BBQ chicken and ribs, hamburgers, hot dogs, etc. Uncle Ernie's is an institution! It's a great spot for a cheap bite to eat. Many celebs have been spotted eating here, including Uma Thurman. The alley way of sorts that is between Madeariman and Uncle Ernie's is the more heavily used Shoal Bay entrance. Clusters of umbrellas and chairs line the beach around this part of Lower Shoal Bay. The beach furniture tends to belong to the businesses they are in front off. I've found that some let you use the chairs with your patronage and others may charge. I can't personally speak for Uncle Ernie's or Mac and Hank's regarding food, though Nori definitely vouches for Uncle Ernie's! If you have any input on Uncle Ernie's or Mac and Hank's, please share! 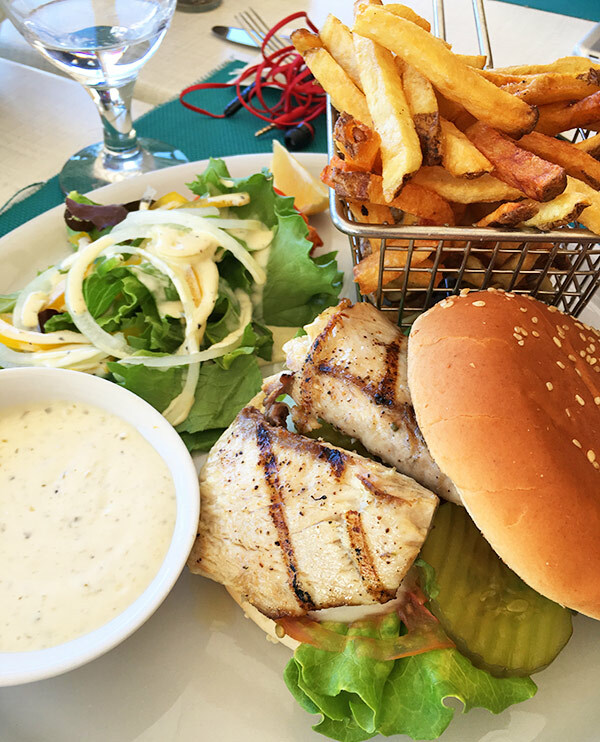 Click here to share your Anguilla restaurant review. Looking to the sea from Madeariman/Uncle Ernie's... People smiling, splashing and having fun. Next up is Manoah, a boutique luxury hotel complete with terrific beachfront restaurant and beach/pool club. More on The Manoah Boutique Hotel. Shoal Bay Villas is immediately to the east of Manoah. Shoal Bay Villas is reasonably priced and has a loyal following. There is another little stretch of bush and seagrape trees before you get to Elodia's Beach Bar and Restaurant. Since Elodia's is set apart somewhat from the "heart" of Shoal Bay, it could be considered a little more quiet. Likewise as Uncle Ernie's, I've only been to Elodia's once and several years ago. I had a burger and once more, it was no Ferryboat Inn burger. I recall their menu having sandwiches and such lunch fare. Elodia's has somwehat of a loyal following but I'm sticking with my faves for now! Penelope Cruz was even photographed lazing on their beach chairs during the off-season. Many say they have a killer rum punch! The next area on the beach is Malakh Day Spa. I visited Malakh once for a massage and it was an incredibly relaxing and reviving one. Malakh sits right on the beach. Malakh's special bonus? You are so close to the sea, you can really relax to the soothing sounds of the surf. The hotel Allamanda sits back behind Elodia's and Malakh. It is not directly on the beach but is considered a Shoal Bay hotel since it is so easily walkable. Heading east beyond Elodia's, I start getting close to my favorite part of Shoal Bay! I call it "the bend", it only seems natural. 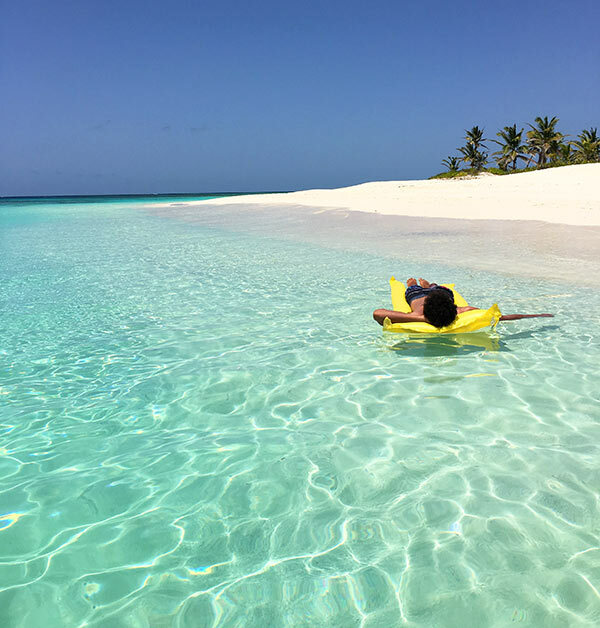 The bend also ranks as one of my favorite spots on all of Anguilla and there are so many incredible spots on this amazing island! This is a great time to stop, take a deep breath, and fill your eyes with the invigorating scenery. Ok, back to the walk! Walking to the right around the bend you see an area called Sea Rocks up on the hills to the left. 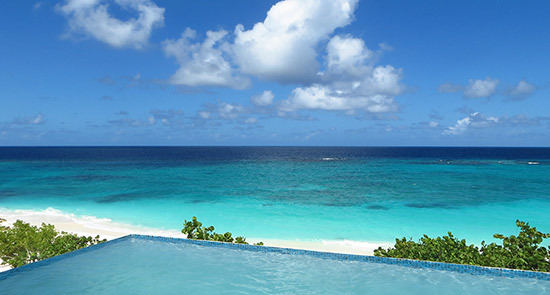 There are many beautiful homes and Anguilla villas there, including Tortue Villa. Ahead is a mostly straight stretch of beach that leads you to the remaining business on Shoal Bay, Upper Shoal Bay, to be specific. At certain times of day the glow coming from the tuquoise water on Upper Shoal Bay is almost electric-looking! 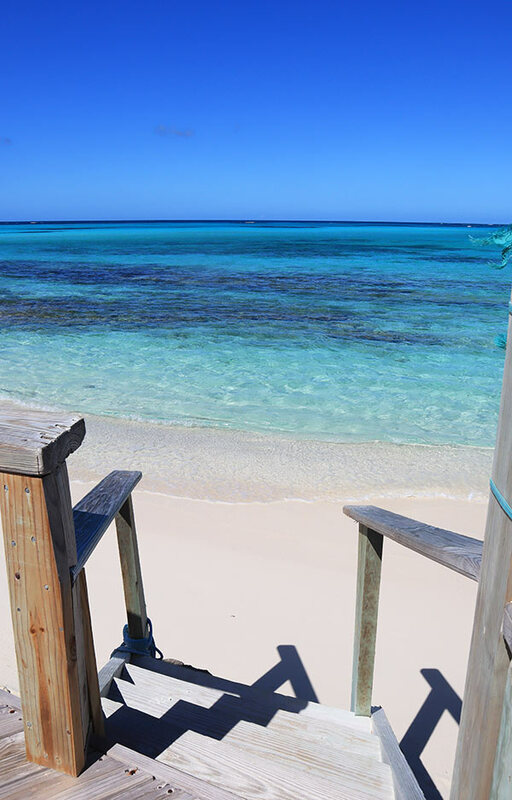 Serenity Cottages sits at the end of Upper Shoal Bay. You literally can't go further once you see them. They seem nice and quiet, tucked away at the end of a glorious stretch of beach. I can't end this page on Shoal Bay without noting the incedible sunsets you can see here! Granted there are many, many ideal spots for sunset on the special island of Anguilla, Shoal Bay is no exception. If you are on Lower Shoal Bay, the sunset will set to your left and over the sea. If you visit on Anguilla and aren't staying on Shoal Bay, you should make sure to plan an evening to catch a sunset there. Sunset over on of the world's greatest beaches... Yes! Don't miss it! 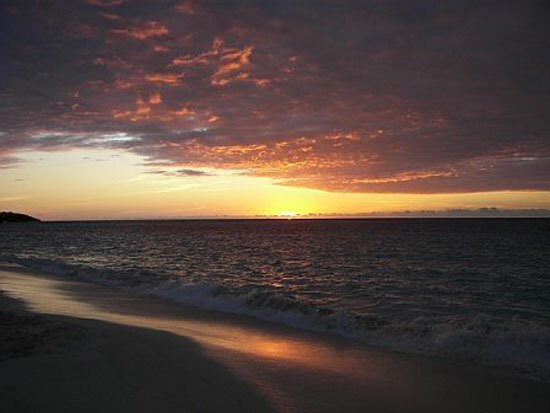 A warm Shoal Bay sunset, taken near Tropical Sunsets. A perfect end an Anguilla Beach Day! Gwen's is a favorite of many. I love her cole slaw and her ribs aren't too shabby either! It's a lovely spot to spend a day and have something yummy to eat. Tip: On Sunday's in high-season, be prepared to wait! The scratch-band is on hand and people arrive in loads...so sit back, relax, dance, swim, enjoy! 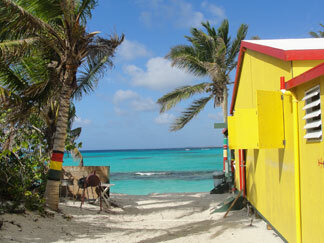 Read more about Gwen's Reggae Grill on Shoal Bay here!